Welcome to today's BEST blog interview with Marjolein. She is located in Elst, Netherlands where she loves to create things out of paper including notebooks, journals and cards. She sells all her handmade goods on Etsy under the name papierdier, which means paper animal in Dutch. Hi Marjolein. Tell us about the items you make and sell. What made you decide to start your own shop? I create handmade notebooks, greeting cards and notepads, in which I combine my passion for graphic design with illustration and bookbinding. It all started with the idea of creating my own notebooks. I was bored by the stationery sold at typical stores, and I thought: I'll design it myself! One day I discovered my mother’s old school notebook, from about 44 years ago, with some stunning plant specimens in it. So carefully conserved and cute, with the old pieces of tape that turned sepia. My mother would tell me about it — all of those plants or leafs were picked by her in the garden, behind the house where my grandfather still lives. I created a series of handmade paper goods out of it, with a print of the dried plants. With those items, I started my shop, papierdier, on Etsy. Now I also design greeting cards, typographic items, bags and planners. 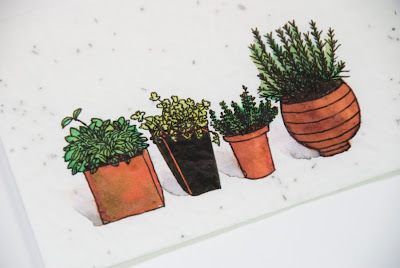 You can find more about the story behind her series with dried plants here. How and when did bookmaking enter your life? Have you taken classes or are you self-taught? 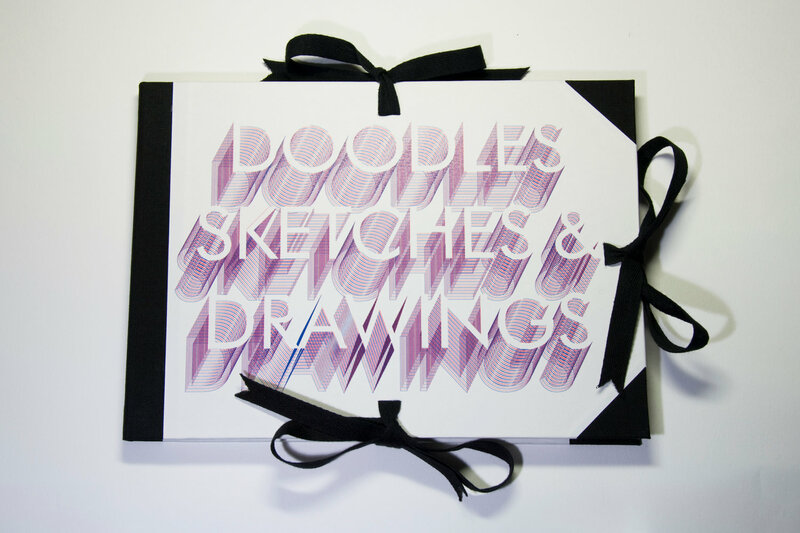 My interest in bookmaking started at Art Academy, where I studied graphic design and began my love for book design. In books, a lot of things come together — of course the content, but also graphic design, typography and photography. A book is also a three-dimensional object. 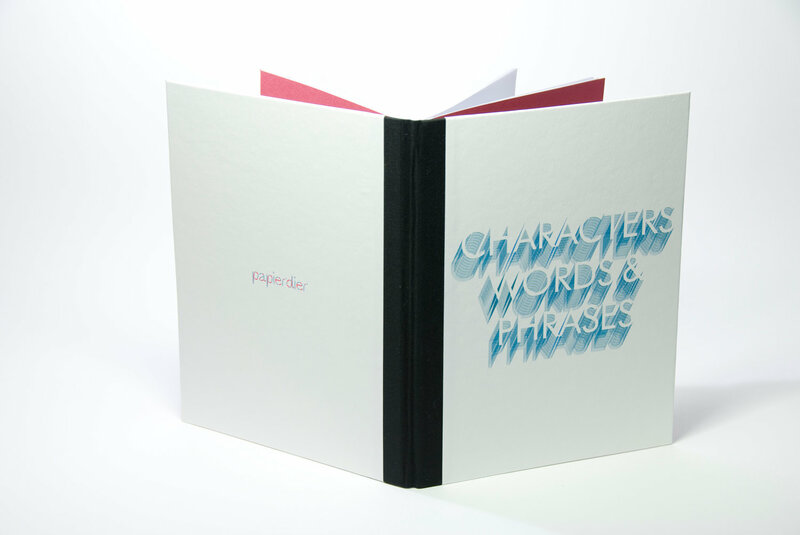 The size, texture, type of paper, way of binding — all very important. I've taken classes at a professional book binder to learn the most important skills. 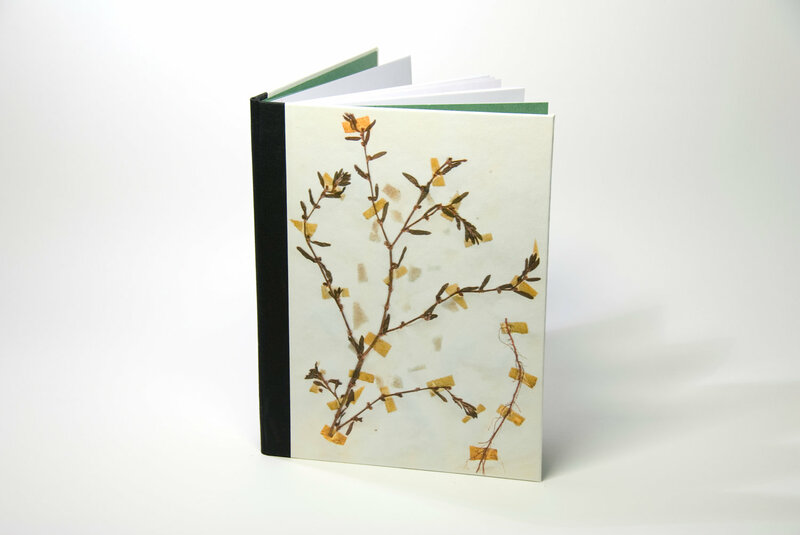 That inspired me to use those bookbinding skills to create products with my own signature and design. Being a graphic designer, how does that world influence your bookmaking projects, and/or vice versa? I know that there are many sellers on Etsy that have a lot of bookbinding skills and experience that I will never have. However, that's not a problem because I try to distinguish myself for other things. For me, graphic design is my main business, but I love to combine it with bookmaking, illustration, photography and crafting handmade items. I use my shop on Etsy as a platform to show what I design, and what I've learned and invented with new items. For me, Etsy is more than my shop — I get inspired by creative people all around the world, and I love to showcase and share my work there. 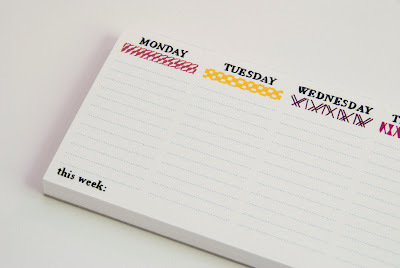 How do you fit bookbinding and making other items into your schedule? I always have more ideas than time to create items. I keep a little sketch book with me, in which I write and draw my ideas, thoughts and doodles. Most of the time I work in periods: some weeks in which I create new items, write new blog posts etcetera and some weeks in which I stop creating, but do other things that give me new inspiration. 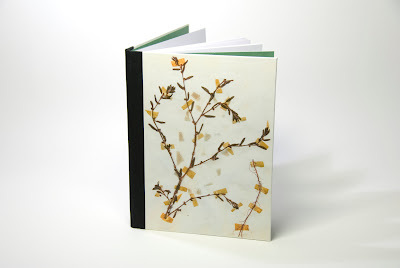 I'm curious about other bookbinder's habits/rituals/preparations during the process of making. Can you share with us your ideal setting for when it's time to make things? What makes you most productive? What works best for me, is to write down my ideas in my sketchbook and think about it for a long time. In the meantime, I see things that inspire me, and help the idea evolve in my head. I love to go to museums to see modern art, and read about design, art and architecture in books and magazines. The best setting for making things is then to shut off the computer (no distractions!) and to start sketching, experimenting, trying, and creating. I prefer to start by hand with sketches, and to work things out with my computer. Then end again with handmade work. What has been your favorite piece you've made? Tell us a little bit about it. 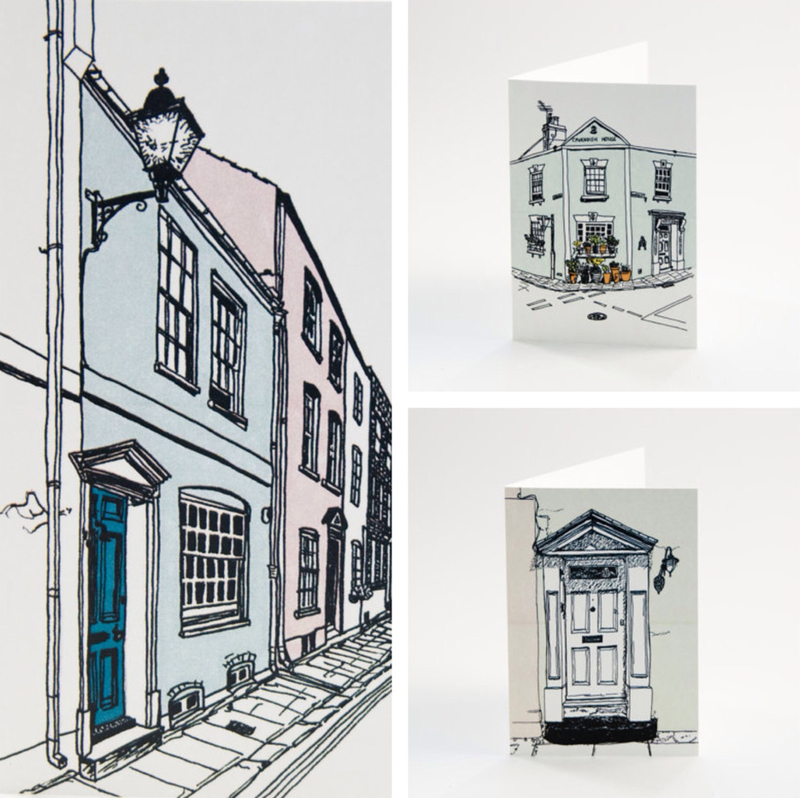 My favorite pieces are three greeting cards with my illustrations of houses in England. 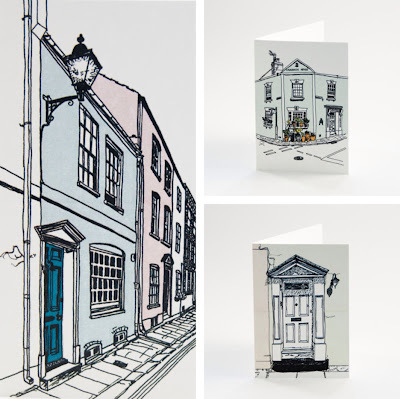 I wanted these illustrations to reflect the atmosphere in the English coast villages in Kent. That atmosphere of the sea, the light and the beautiful landscape along the coast is something that really inspired me during a trip in that area. What do you see in store for the future of your shop? My dream is to add more items to my shop and to generate more views and sales. I want to make people happy with my designs. The idea I'm currently working on, is to create a series of handmade sketchbooks with original cover designs. One thing I also would like to do in the future, is to design typographic posters. So keep in touch! I look forward to seeing more of your amazing work. Thanks for taking the time to do this interview Marjolein! Be sure to visit Marjolein's Etsy shop at papierdier.etsy.com. You can also check out her blog at papierdier.blogspot.com. Like her on facebook.com/papierdier and follow her on Twitter at @papierdier.